How are all you lovelies today? Wonderful and full of wonder I hope. Today I have an extra special piece to share, something I created about a year ago for a very dear girl who was getting ready to graduate high school and then spend a good amount of time over seas on a school trip. Can I admit that I was totally and completely jealous without you thinking less of me? I had almost had a very similar trip when I graduated from high school but alas it fell through so admittedly I was a bit green eyed with envy. However simultaneously I was beyond excited for her as I have had the opportunity to travel out of our country and knew of the awe and wonder that accompanies such a journey so I wanted to create something that was just as unique as I knew this trip was bound to be for her. I started with a balsa box that looks very much like a cigar box and covered it with Tim Holtz's tissue paper. Then as I was deciding what to do I thought perhaps I should not add a whole lot to the top because the balsa wood is a bit more fragile then most wood crafts so I opted for coloring it with some sprays and then adding a Tim Holtz/Sizzix die cut of the world and then a stamped image of a post card that I cut then melted from Shrinky Dink film, the number 15 is for the year of her graduation and her trip to Europe. Along the back side of the box I used the film strip die cut from Tim Holtz/Sizzix and made it an ending piece at the bottom of the box. Within each of it's frames I used letter stickers and spelled out the word 'MEMORIES'. Typically in projects that I do for home decor I try to finish the back as well that way it won't matter where the piece is displayed it will be eye catching at any angle. For the inside of this balsa box I kept it quite simple, I painted it with a metallic champagne color and added the two Tim Holtz flash cards that say 'travel' and the'world'. As for all the goodies inside well lets take a look see. I added a lot of little bits & pieces that hopefully all made sense to my girl. 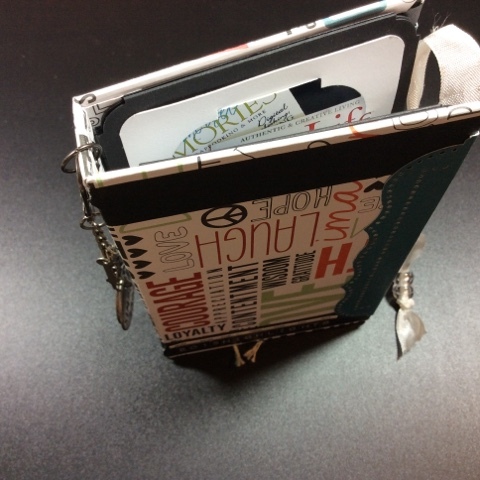 First and foremost I made her a mini book from a Tim Holtz mini kit and although mine has quite a bit added to it, the kit it's self is awesome and comes with a ton of elements but I'll share that book in a separate post. So for right now first and foremost there are these two little mini journals. I made two booklets since she was to be there for two weeks and for each day I made two pages of journal lines for her to jot down the really cool stuff that she didn't want to forget. Although I am not near the traveler that I'd like to be, I've done enough to know that over time you start to forget things that you never thought possible so it is important to document them while they are still in your mind. So this is what the inside looks like, for each day of the week there is a mini file that has two pages of journal lines. In between the files I left blank so that a photo or ephemera could be added to help keep the memories even more alive, my thought is that a Starbucks receipt or the sticker from her cup would be perfect here, or possibly the tag from a new piece of clothing..? Altogether this is what they both look like from a top view. The next piece I included was a burlap drawstring bag and although I added a few more of the Shrinky Dinks I made using some Tim Holtz/Sizzix dies I thought that this would be a great place for little trinkets...coins, flattened eruos (similar to our flattened penny machine thingys), a charm or whatnot. Another piece I added in was a creation of mine that I did for the pure joy of it. Like myself, this dear girl loves coffee and so I couldn't resist making her a little mini coffee booklet as well. I think there are only 5 or 6 pages in this little guy and they are all blank but I figured something will spark a thought while she's having coffee and maybe that'll be just the thing for her to jot down in this guy. Another piece I made was this little ensemble of charms and tags. I used a 7 Gypsies stamp set to make the paper tags and aside from two actual charms, I made the key and lock charms using the Shrinky Dink film and a Tim Holtz/Sizzix die once again then using Rub 'n Buff colored them both an antique gold. How freakin' cute is that anyways...seriously. When I saw this Jolee's Boutique Passport I knew it was a must. Besides being totally awesome all by it's self it was a great way to add in another journal spot, lots of pages to document the journey. As I got more and more involved with this I kept trying more and more crazy ideas. This is definitely one of those ideas...I can't tell you what it is because I don't know, I just made it - thought it looked cool enough - tossed it in with all the rest of the pieces. I figured my girl would know what to do with it...even if not...what the heck. The last piece that I created had more to do with the other portion of her gift. We got her a gift certificate to Persnickety Prints, my favorite on-line photo printing company. Normally I print at home but every once in awhile it's nice to have a whole bunch done at once and not have to do-it-myself so this is who I go to, if you don't know them...you should because in so far - they are awesome I think. Anyways the last piece I created was for photographs printed at either a 4 x 6 size or a 5 x 7 size with a photo sleeve to store them in. Reason being is because the mini book I made (that I will share later) will only fit photos 3 x 3 or smaller and I know for a fact that there will be some she'll want larger than a 3 x 3. Plus it's nice when you can keep all the pieces from your trip together in one place I figured this would certainly help in that regard. Check out the video and hopefully that will answer them for you but feel free to comment me if you have anything further and I'll be happy to respond. Sure hope you enjoyed this piece it is most definitely one of my favorites. And as always thank you for stoppin' in and takin' a peek.